Granulibacter bethesdensis is a Gram-negative pathogen in patients with chronic granulomatous disease (CGD), a deficiency in the phagocyte NADPH oxidase. Repeated isolation of genetically identical strains from the same patient over years, and prolonged waxing and waning seropositivity in some subjects, raises the possibility of long-term persistence. G. bethesdensis resists killing by serum, CGD polymorphonuclear leukocytes (PMN), and antimicrobial peptides, indicating resistance to nonoxidative killing mechanisms. Although G. bethesdensis extends the survival of PMN, persistent intracellular bacterial survival might rely on longer-lived macrophages and their precursor monocytes. Therefore, we examined phagocytic killing by primary human monocytes and monocyte-derived macrophages (MDM). Cells from both normal and CGD subjects internalized G. bethesdensis similarly. G. bethesdensis stimulated superoxide production in normal monocytes, but to a lesser degree than in normal PMN. Normal but not CGD monocytes and MDM killed G. bethesdensis and required in vitro treatment with IFN-γ to maintain this killing effect. Although in vitro IFN-γ did not enhance G. bethesdensis killing in CGD monocytes, it restricted growth in proportion to CGD PMN residual superoxide production, providing a potential method to identify patients responsive to IFN-γ therapy. In IFN-γ–treated CGD MDM, G. bethesdensis persisted for the duration of the study (7 d) without decreasing viability of the host cells. These results indicate that G. bethesdensis is highly resistant to oxygen-independent microbicides of myeloid cells, requires an intact NADPH oxidase for clearance, and can persist long-term in CGD mononuclear phagocytes, most likely relating to the persistence of this microorganism in infected CGD patients. Granulibacter bethesdensis, a member of the Acetobacteraceae family, is a human pathogen that causes infection in patients with chronic granulomatous disease (CGD), a deficiency in the NADPH oxidase (1, 2). This Gram-negative, rod-shaped bacterium has been isolated from at least six CGD patients in the United States and Spain (3–5). G. bethesdensis can cause recurrent infections in a CGD patient over several years that may be the result of reinfection with different bacterial strains or reactivation of the same strain (3, 4). This organism displays a high degree of resistance to host defenses, as evidenced by isolation from spleens of wild-type mice 76 d postinfection and from excised lymph nodes of a CGD patient 5 mo after the onset of symptoms and unresponsiveness to antimicrobial treatment (3). The increasing numbers of clinical infections caused by G. bethesdensis as well as other species of acetic acid bacteria (6–12) underscore the need for a better understanding of the microbial pathogenesis of the Acetobacteraceae family. Previous work has demonstrated that G. bethesdensis is serum resistant and internalized by human peripheral blood polymorphonuclear leukocytes (PMN) in a complement-dependent manner (13). CGD PMN were incapable of killing G. bethesdensis, suggesting that this organism is resistant to nonoxidative killing mechanisms. PMN are short-lived cells that undergo apoptosis and efferocytosis by macrophages for inflammation resolution (14). Delayed PMN apoptosis and defective macrophage efferocytosis are observed in CGD (15, 16). Given that G. bethesdensis persists for 24 h in CGD PMN, in contrast to ∼50% clearance of the organism by normal PMN in the same time frame (13), we hypothesized that long-term intracellular bacterial survival in the host might rely on longer-lived macrophages and precursor monocytes. In this study, we show that normal monocytes and monocyte-derived macrophages (MDM) internalize G. bethesdensis and kill it in a NADPH oxidase-dependent manner, whereas this organism persists and proliferates in CGD monocytes and MDM. Resistance of G. bethesdensis to NADPH oxidase-independent myeloid host defenses most likely plays an important role in long-term infections observed in CGD patients. Blood samples were obtained after informed consent from healthy and CGD donors enrolled at the National Institutes of Health Clinical Center, as defined in National Institutes of Health institutional review board–approved protocols. Human PMN were isolated from citrated peripheral blood, as previously described (17). For the monocyte isolation, every 10 ml citrated peripheral blood was diluted 1:3 in HBSS− and layered on 15 ml 53% Percoll (diluted in PBS without Ca2+, Mg2+). PBMC layers were collected, and cells were washed twice in HBSS−. Monocytes were isolated with CD14 Ab-coupled magnetic beads, according to the manufacturer’s instructions (Miltenyi Biotec, Auburn, CA). Monocyte purity (∼85–95%) was confirmed using CD14 surface staining and flow cytometry as well as differential staining and light microscopy. In some cases, CD14+ cells were further differentiated into MDM by culturing in RPMI 1640 containing 2 mM l-glutamine, 10 mM HEPES (pH 7.2), 10% autologous serum, and 50 ng/ml M-CSF (Invitrogen, Carlsbad, CA) for 7 d. Media were replaced every 3–4 d. Where indicated, monocytes and MDM were treated with 65 U IFN-γ/ml (eBioscience, San Diego, CA) or PBS control for 2 d. Serum was collected from BD serum separator tubes, according to the manufacturer’s instructions, and used fresh or snap frozen and stored at −80°C. G. bethesdensis NIH1.1 was cultured for 2 d and subcultured for 1 d to midlog phase in YPG medium (13). Escherichia coli TOP10 was grown for 1 d and subcultured for 3 h to midlog phase in Lysogeny broth. Washed bacteria were enumerated by OD 600 nm using a NanoDrop ND-1000 (Grace Scientific, Clarksburg, MD). Freshly isolated monocytes (2.5 × 105/condition) were infected with G. bethesdensis for 1 h at the indicated multiplicity of infections (MOIs) in 96-well plates. Plates had been precoated with 10% autologous serum for at least 1 h at 37°C and washed three times with HBSS−. Cells were incubated with no serum, autologous serum, or autologous serum incubated for 30 min at 56°C, which inactivates complement. Heat-inactivated serum was centrifuged at 10,000 × g for 10 min at 4°C to pellet protein aggregates. Plates were centrifuged at 362 × g for 8 min at 4°C to synchronize phagocytosis. Cells were removed with Cellstripper (Mediatech, Manassas, VA), subjected to cytospin, and differentially stained with HARLECO Hemacolor stain set (EMD Chemicals, Billerica, MA). Each sample was imaged, and intracellular bacteria were scored in a blinded manner. A total of 3 × 105 or 5 × 105 freshly isolated monocytes was adhered to 12- or 18-mm ethanol-washed cover glasses in 24- or 12-well plates, respectively. G. bethesdensis was labeled with pHrodo Red succinimidyl ester (Invitrogen), according to the manufacturer’s instructions. pHrodo-labeled bacteria were incubated with cells at the indicated MOIs and time points in the presence of serum or heat-treated serum (as described above) in RPMI 1640 containing 25 mM HEPES (pH 7.2). Plates were centrifuged at 362 × g for 8 min at 4°C to synchronize phagocytosis. Cells were washed with cold PBS twice, fixed with 4% paraformaldehyde for 5 min at room temperature in the dark, and washed with cold PBS or HBSS twice. Cover glasses were mounted on glass slides using VECTASHIELD Mounting Medium with DAPI (Vector Laboratories, Burlingame, CA), or 1 μg/ml DAPI was added to the last wash prior to mounting, and imaged using a Leica SP5 X-WLL confocal microscope or a Leica Episcope with a DFC360FX camera (Leica Microsystems). For kinetic analyses, at least 100 cells were scored for the presence of internalized pHrodo bacteria using Imaris software (Bitplane, South Windsor, CT). Bacterial activation of PMN or monocyte luminol-enhanced chemiluminescence was measured at the indicated MOIs in an assay composed of PMN or monocytes at 1 × 106/ml in RPMI 1640 medium with 10% autologous serum, 25 mM HEPES (pH 7.2), and 50 μM luminol, essentially as previously described (13). Freshly isolated PMN, freshly isolated monocytes, or 2-d-old monocytes or MDM treated with 65 U IFN-γ/ml or PBS control were infected with G. bethesdensis (preopsonized with serum) in 96-well plates for the indicated times and at the indicated MOIs. Plates were precoated with 10% autologous serum, as described above. At each time point, a final concentration of 0.5% saponin was added per well. Plates were incubated on ice for 10 min before shearing the samples 10 times through a 28-1/2–gauge needle to lyse phagocytes. Samples were diluted in saline, spread on YPG agar plates, and incubated 3–4 d at 37°C. In some cases, MDM were grown in 35-mm petri dishes, treated with IFN-γ for 2 d, and infected with preopsonized G. bethesdensis for 1 wk before harvesting with Cellstripper. Cells were then subjected to cytospin, differentially stained, and imaged via light microscope. Freshly isolated monocytes (1 × 105/200 μl/well) or MDM (5 × 104/200 μl/well) were not infected or infected with G. bethesdensis or E. coli at an MOI of 1 or 0.25, respectively, in 96-well plates (precoated with 10% autologous serum, as described above) in the presence of 10% autologous serum for 24 h. Supernatants were collected and frozen until analysis. Thawed supernatants were diluted 1:3, and cytokines were measured using a Bio-plex Pro 17-plex Human Cytokine Assay Kit analyzed on a Bio-plex system 200 running Bio-plex Manager (version 5.0), according to the manufacturer’s instructions (Bio-Rad, Hercules, CA). Freshly isolated monocytes (2 × 105/200 μl/well) were infected with G. bethesdensis at the indicated MOIs in 96-well plates (precoated with 10% autologous serum, as described above) in the presence of autologous serum for 24 h before addition of 50 μl XTT reagent (1 mg/ml XTT, 25 μM phenazine methosulfate). After 4 h, the absorbance was measured at 450 nm with a Beckman Coulter DTX 880 Multimode Detector, and the background OD of media alone was subtracted to give corrected OD. Flow cytometry was performed on a BD FACS Canto, and the data were analyzed using FlowJo (Tree Star, Ashland, OR). All other data were graphed and analyzed statistically using GraphPad Prism (version 5; GraphPad Software, La Jolla, CA). For statistical tests, *p ≤ 0.05, **p ≤ 0.01, ***p ≤ 0.001, ****p ≤ 0.0001. Serum contains opsonins, including heat-stable Abs and heat-labile complement proteins, which coat microbes and can trigger their uptake by phagocytes. We tested whether normal CD14+ monocytes internalize G. bethesdensis and whether this process was serum dependent. Most bacteria were internalized in the presence of serum after 1 h at MOIs of 10:1 (Fig. 1A) and 20:1 (data not shown), as assessed by light microscopy. Little internalization occurred in the absence of serum, and there was ∼50% reduction in internalization by normal monocytes incubated with heat-treated serum. Confocal microscopy of normal monocytes incubated with G. bethesdensis labeled with pHrodo, a dye that fluoresces more intensely at an acidic pH, also demonstrated greater internalization of bacteria in the presence of serum, but not heat-treated serum (Fig. 1B). CGD monocytes internalized a similar amount of bacteria as normal monocytes in the presence of fresh serum (p = 0.114, Mann–Whitney U test) and less so in the presence of heat-treated serum (p = 0.081, Mann–Whitney U test) (Fig. 1A). 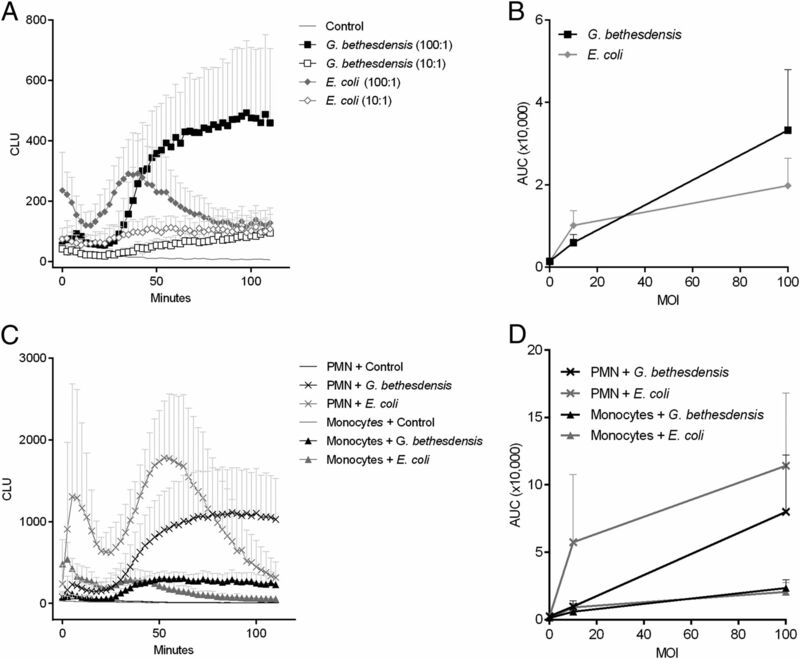 CGD monocytes followed a similar time course of pHrodo-bacteria internalization as normal monocytes, with maximal uptake by 30 min postinfection (Fig. 1C). Maximal internalization at 30 min was also confirmed by scoring the number of pHrodo-labeled bacteria per cell (data not shown). Little to no internalization occurred in the absence of serum for either cell type (data not shown). These results show that monocytes internalize G. bethesdensis, and this is partially dependent on a temperature-sensitive serum component for normal monocytes. 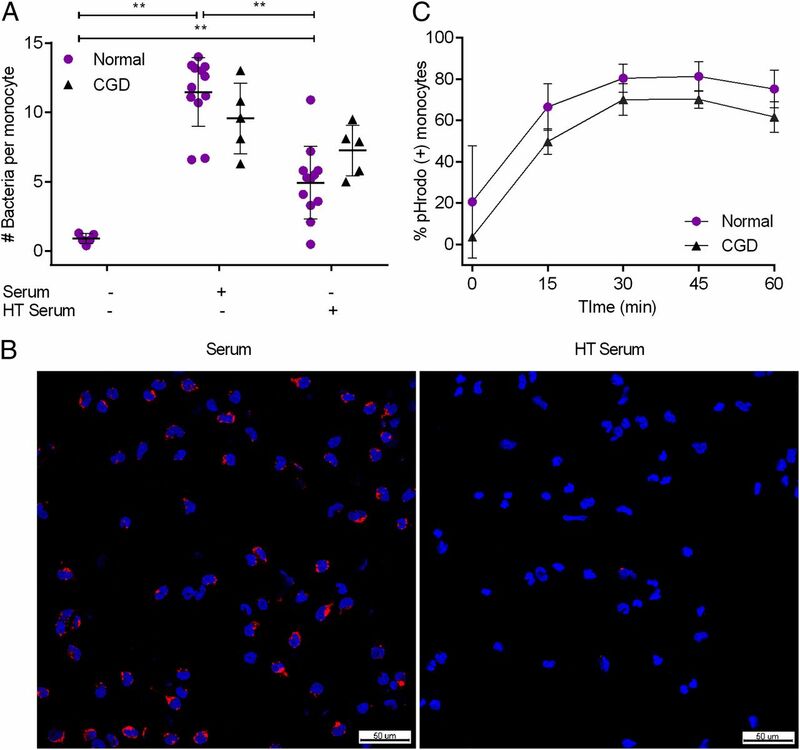 Serum-dependent internalization of G. bethesdensis by CD14+ monocytes. (A) CD14+ monocytes from normal (n = 5–12) and CGD (n = 5) donors were incubated with G. bethesdensis at an MOI of 10 bacteria per host cell for 1 h in the absence of serum or presence of autologous serum or heat-treated (HT, 56°C, 30 min) serum, as described in Materials and Methods (mean ± SD, nonparametric t tests where **p ≤ 0.01). Internalization of bacteria by CGD monocytes in the absence of serum was not determined. (B) Confocal microscopy imaging of normal CD14+ monocytes incubated with pHrodo-labeled G. bethesdensis (red) at an MOI of 10 bacteria per host cell for 1 h in the presence of autologous serum or heat-treated serum. Nuclei are labeled with DAPI (blue). Bar length, 50 μm. (C) CD14+ monocytes from normal (n = 3) and CGD (n = 3) donors were incubated with pHrodo-labeled G. bethesdensis at an MOI of 1 bacterium per host cell for the indicated time points in the presence of autologous serum. Epifluorescence images were scored, and data were represented as mean ± SD. The phagocyte NADPH oxidase (NOX2), the enzyme complex defective in CGD, is activated by microbes and their products, and normally generates superoxide that is transformed into a variety of microbicidal reactive oxygen species (ROS) like hydrogen peroxide and hypohalous acids (18). Previous studies showed that G. bethesdensis was less effective at activating normal PMN NOX2 than E. coli (13). We measured normal monocyte superoxide production in response to G. bethesdensis and E. coli using luminol-enhanced chemiluminescence. A dose-dependent luminol-enhanced chemiluminescence response occurred when normal monocytes were incubated with G. bethesdensis (Fig. 2A, 2B). This response was dampened in the absence of serum (data not shown), suggesting that phagocytosis of G. bethesdensis or phagocyte interaction with serum components such as complement is at least partially required for the generation of superoxide in monocytes. E. coli was equivalently stimulatory compared with G. bethesdensis (Fig. 2B), but the kinetics of the response differed (Fig. 2A). The relative lag in response to G. bethesdensis (Fig. 2A) mirrored the kinetics of internalization (Fig. 1C). G. bethesdensis induces oxidative burst activity in normal CD14+ monocytes. (A) Luminol-enhanced chemiluminescence was measured in monocytes exposed to control buffer, G. bethesdensis, or E. coli at MOIs of 100 and 10 bacteria per host cell in the presence of autologous serum. Data are mean + SD for seven donors. (B) Data from (A) are represented as area under the curve (AUC). (C) Luminol-enhanced chemiluminescence was measured in PMN and monocytes [isolated from the same donors (n = 6)] exposed to control buffer, G. bethesdensis, or E. coli at an MOI of 100 bacteria per host cell in the presence of autologous serum. Data are mean + SD. (D) AUC data for PMN and monocytes, from the same donors (n = 6), exposed to bacteria at MOIs of 100 [shown in (C)] and 10 bacteria per host cell in the presence of autologous serum. In comparison with PMN, monocytes generated a weaker response to G. bethesdensis and E. coli (Fig. 2C, 2D). This difference in respiratory burst has been previously shown for PMN and monocytes stimulated with E. coli, PMA, or zymosan (19–22). It should also be noted that E. coli induced a biphasic response in monocytes and PMN (Fig. 2A, 2C). Based on experiments in which the stimulus was mixed in with the cells versus gently added, it was determined that the first peak was due in part to mechanical stimulation during initial stimulus addition, whereas the second peak occurred as a direct result of the stimulus interacting with the phagocytes (data not shown). Taken together, G. bethesdensis induces a respiratory burst in normal monocytes and to a greater extent in normal PMN. Stimulation of a respiratory burst in monocytes has been linked to killing of internalized organisms such as Staphylococcus aureus (23). Given that G. bethesdensis induces superoxide in monocytes, we hypothesized that monocytes would also be able to kill G. bethesdensis. Normal monocytes killed G. bethesdensis in a dose-dependent manner after 24 h of infection (Fig. 3A). In contrast, CGD monocytes were incapable of killing G. bethesdensis and, moreover, provided a suitable environment for growth of the organism (Fig. 3A). To exclude outgrowth of extracellular bacteria, gentamicin protection assays were performed. Although qualitatively similar results were obtained 1 h postinfection, with or without gentamicin, almost complete killing occurred in both normal and CGD monocytes by 24 h after gentamicin washout, indicating that this organism is sensitive to gentamicin internalized by monocytes prior to washing (data not shown). A comparison of PMN and monocytes isolated from the same normal donors showed that both cell types killed similar amounts of G. bethesdensis (Fig. 3B). Therefore, monocytes require the NADPH oxidase for the killing of G. bethesdensis and exhibit bactericidal activity on par with PMN. 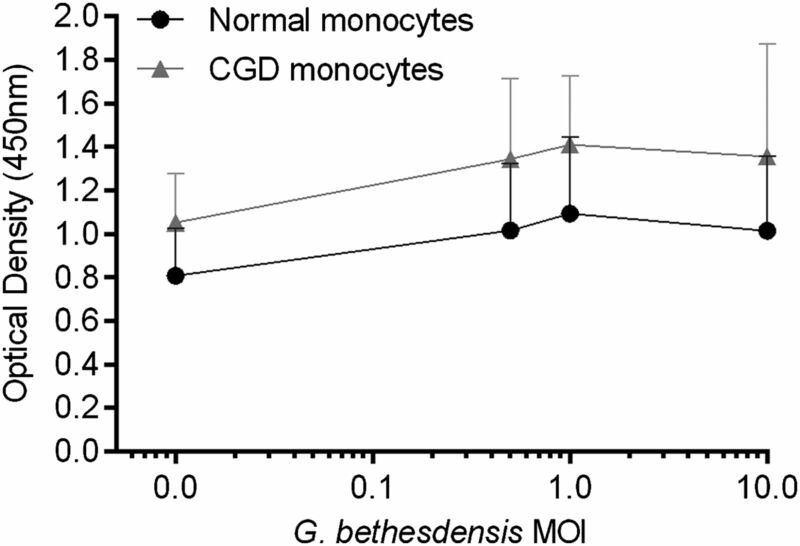 Freshly isolated normal, but not CGD CD14+ monocytes kill G. bethesdensis. (A) CD14+ monocytes from normal (n = 9) and CGD (n = 3) donors were incubated with G. bethesdensis at MOIs of 2, 1, and 0.5 bacteria per host cell in the presence of autologous serum for 24 h. Data are represented as mean + SD. Linear regression analysis was conducted to assess differences in slope of lines (*p ≤ 0.05) for normal versus CGD. (B) PMN and monocytes isolated from the same normal donors (n = 8) were incubated with G. bethesdensis at an MOI of 1 bacteria per host cell in the presence of autologous serum for 24 h. Data are represented as percentage of control input (mean ± SD). Treatment of monocytes with IFN-γ significantly enhances their microbicidal activities (24–26), possibly through the upregulation of NOX2 expression (27, 28). We tested whether treatment of normal monocytes with IFN-γ for 2 d altered their ability to kill G. bethesdensis. Whereas normal monocytes cultured for 2 d without IFN-γ lost their ability to kill, IFN-γ treatment maintained the killing abilities of normal monocytes (Fig. 4A). Similar amounts of G. bethesdensis were recovered when the bacteria were incubated with PBS control or IFN-γ in the absence of monocytes (data not shown). G. bethesdensis-stimulated normal monocytes pretreated with IFN-γ produced significantly more superoxide, as measured by chemiluminescence, compared with monocytes not receiving IFN-γ (data not shown), suggesting a link between induced superoxide and enhanced antibacterial activity after IFN-γ treatment. These data confirm that IFN-γ treatment is important for the maintenance of in vitro monocyte bactericidal activity and may augment phagocytic killing in vivo (29, 30). IFN-γ maintains microbicidal activity of normal monocytes and stimulates monocytes from some CGD subjects to control G. bethesdensis growth. (A) Monocytes from normal (n = 24) and CGD (n = 16) donors were treated with PBS control or 65 U IFN-γ/ml for 2 d before infection with G. bethesdensis for 24 h at an MOI of 1 bacterium per host cell in the presence of autologous serum. Data are represented as percentage of control input. Significance testing of PBS control versus IFN-γ treatment was by Wilcoxon paired t test (****p ≤ 0.0001). 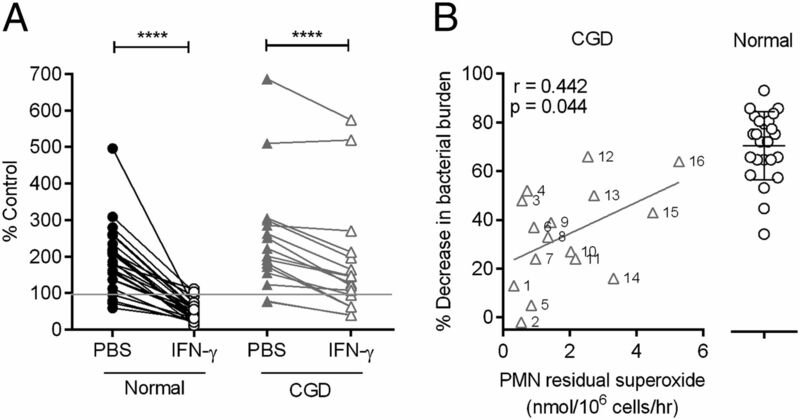 (B) Percentage decrease in bacterial burden after IFN-γ treatment relative to PBS control for all normal and CGD monocytes in (A). Percentages for CGD monocytes are plotted against residual superoxide in PMN from the same CGD patients. The relationship of the two variables was assessed using a Spearman correlation, and the best fit (Y = 6.409× + 21.59) is depicted. Because IFN-γ maintains normal monocyte killing of G. bethesdensis, we next tested the capacity of IFN-γ–treated CGD monocytes to kill G. bethesdensis. When considered as a group, monocytes from CGD patients were responsive to IFN-γ treatment, as indicated by significantly reduced bacterial burdens compared with CGD monocytes that had not received the cytokine (Fig. 4A). Interestingly, the magnitude of the monocyte response to IFN-γ varied considerably from patient to patient. Previous studies indicated that IFN-γ treatment can enhance superoxide production in CGD monocytes if there are detectable levels of residual superoxide at baseline (29, 31). Moreover, enhanced monocyte superoxide production accompanied bactericidal activity against S. aureus for a CGD patient receiving in vivo IFN-γ treatment (29). Given these previous studies, we predicted a priori a positive relationship between residual PMN ROS production (32) and monocyte killing of G. bethesdensis. Thus, we employed a one-tailed p value to test this prediction. A Spearman correlation demonstrated a positive relationship (r = 0.442) between reduction in bacterial burden and CGD neutrophil residual superoxide that was statistically significant (one-tailed p value = 0.044) (Fig. 4B). The genetic background of these CGD patients is described in Table I. Understanding the mechanism of IFN-γ–induced bactericidal activity of CGD monocytes could prove a powerful diagnostic tool to determine the likelihood that IFN-γ treatment will benefit specific CGD patients. We next assessed the impact of G. bethesdensis infection on monocyte viability using an XTT assay, which measures the reduction of XTT to an orange formazan product by metabolically active cells. No significant difference was detected between normal and CGD monocytes either uninfected or incubated for 24 h with G. bethesdensis at MOIs of 0.5:1, 1:1, and 10:1 in the presence of serum (Fig. 5), indicating that monocytes remain viable in the presence of G. bethesdensis. G. bethesdensis infection does not alter monocyte survival. Monocytes from normal (n = 6) or CGD (n = 3) donors were incubated alone or with G. bethesdensis at MOIs of 0.5, 1, or 10 bacteria per host cell in the presence of autologous serum for 24 h. Cell viability was assessed using an assay that measures conversion of XTT to an orange formazan product by metabolically active cells (mean OD + SD). Peripheral blood monocytes are precursors to macrophages, supplying tissues during steady-state conditions or in the setting of infection (33). Culturing CD14+ monocytes in the presence of M-CSF for 1 wk results in a macrophage-like phenotype (34). Whereas normal MDM enabled growth of G. bethesdensis, treatment of these cells for 2 d with IFN-γ generated MDM capable of controlling G. bethesdensis growth in a dose-dependent manner (Fig. 6A). CGD MDM were significantly less effective in controlling G. bethesdensis growth either in the absence or presence of IFN-γ (Fig. 6B). We confirmed via confocal microscopy that normal and CGD MDM internalized similar amounts of bacteria at various MOIs in the presence of serum after 1 h (data not shown). Normal but not CGD MDM control G. bethesdensis growth after 24 h of infection. (A) Normal MDM were incubated ± 65 U IFN-γ/ml for 2 d before coculture with G. bethesdensis for 24 h at the indicated MOI in the presence of autologous serum. Data are presented as mean + SD (n = 11 donors). Linear regression analysis was conducted to assess differences in slope of lines (**p ≤ 0.01) for PBS control versus IFN-γ treatment. (B) MDM were treated as in (A) at an MOI of 0.25 bacteria per host cell. Data are percentage of control input for 11 normal donors and 5 CGD donors. Wilcoxon paired t test was used to compare PBS control versus IFN-γ treatment (***p ≤ 0.001). Macrophages are highly phagocytic cells that support the persistence of several bacterial pathogens such as Salmonella typhimurium, Mycobacterium tuberculosis, Legionella pneumophila, and Brucella species (35–37). Given that normal MDM were incapable of controlling G. bethesdensis growth at the MOIs tested after 24 h, unless supplemented with IFN-γ, we examined the survival of these bacteria after 1 wk of coculture with MDM. 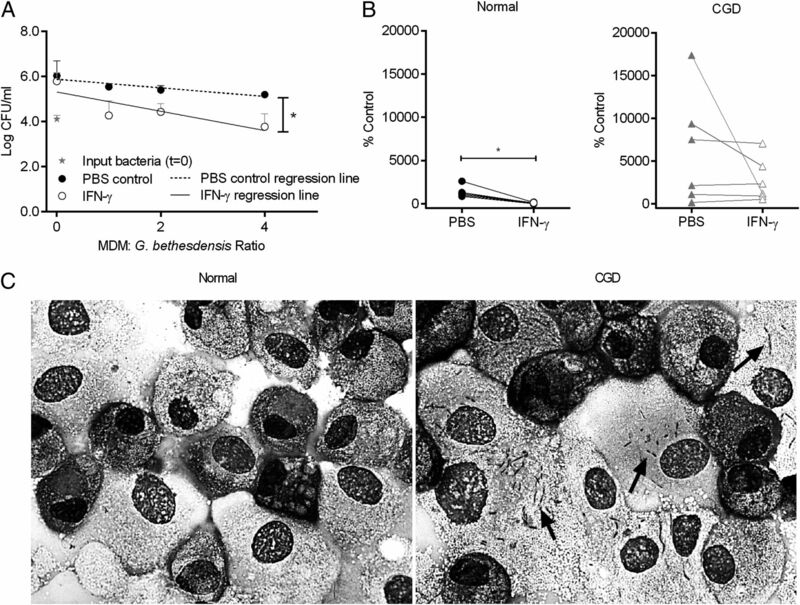 IFN-γ–treated normal MDM infected for 1 wk killed G. bethesdensis at an MOI of 0.25 bacteria per host cell (Fig. 7A, 7B). However, IFN-γ–treated CGD MDM maintained a favorable environment for G. bethesdensis survival (Fig. 7B, 7C). No decrease in viability, as assessed by lactate dehydrogenase assay and XTT assay, was observed for normal or CGD MDM infected with G. bethesdensis for 1 wk compared with noninfected MDM incubated for the same time period (data not shown). Based on these findings, the CGD macrophage may contribute to the persistence of this bacterium. G. bethesdensis persists inside CGD MDM for 1 wk. (A) Normal MDM were incubated ± 65 U IFN-γ/ml for 2 d before coculture with G. bethesdensis for 1 wk at the indicated MOI in the presence of autologous serum. Data are presented as mean + SD (n = 6 donors). Linear regression analysis was conducted to assess differences in slope of lines (*p ≤ 0.05) for PBS control versus IFN-γ treatment. (B) MDM were treated as in (A) at an MOI of 0.25 bacteria per host cell. Data are percentage of control input for six normal donors and six CGD donors. Wilcoxon paired t test was used to compare PBS control versus IFN-γ treatment (*p ≤ 0.05). (C) IFN-γ–treated normal and CGD MDM infected for 1 wk with G. bethesdensis at an MOI of 1 bacterium per host cell. Black arrows indicate the presence of bacteria. Proinflammatory cytokines initiate host responses during infection, whereas anti-inflammatory cytokines play a significant role during the resolution phase once infection has been contained. Increased proinflammatory and decreased anti-inflammatory cytokine production have been reported for activated CGD cells compared with activated normal cells in some settings (16, 38), whereas, in others, the opposite trend was observed (39). We measured cytokine concentrations in supernatants from normal and CGD monocytes and MDM cultured with G. bethesdensis or E. coli for 24 h. Both bacteria induced proinflammatory and anti-inflammatory cytokine release from all cell types tested with E. coli eliciting significantly greater responses than G. bethesdensis (Table II). No significant differences could be detected between noninfected normal and CGD cell cultures. However, CGD monocytes produced significantly more cytokine than normal monocytes when infected with either bacterium, whereas MDM responses were similar in magnitude for normal versus CGD. There was little to no production of IL-1β (for MDM), IL-2, IL-4, IL-5, IL-7, IL-12p70, IL-13, and GM-CSF (data not shown). Taken together, the lower cytokine responses of monocytes and MDM to G. bethesdensis, compared with E. coli, may help G. bethesdensis persist in these cells. G. bethesdensis is a bacterial pathogen that can infect patients with CGD. Isolation of genetically indistinguishable strains from individual subjects over 2–3 y, despite periods without clinically evident infections, may reflect either reinfection or reactivation of a latent infection. Persistence of bacteria has been suggested for a number of human diseases, including Legionnaires’ disease (L. pneumophila) (40), tuberculosis (M. tuberculosis) (41), and brucellosis (Brucella species) (42). G. bethesdensis shares several attributes with these microbes that may explain its ability to survive in the host for a long period of time, as follows: 1) resistance to killing by nonoxidative host defenses; 2) replication and survival inside host cells; and 3) promotion of host cell survival. The natural reservoir for G. bethesdensis and the mode of entry into the human host are unknown. Regardless of the site of entry, G. bethesdensis must resist a variety of innate immune host defenses to establish infection. G. bethesdensis is resistant to killing by human serum and the cathelicidin cationic antimicrobial peptide (13). Serum resistance has been linked to increased virulence in other Gram-negative bacilli such as L. pneumophila strain UH1 (43), O-Ag–positive B. abortus strains (44), and many others. Virulence factors also enable L. pneumophila (45, 46), M. tuberculosis (47), and Brucella species (48) to resist killing by a variety of cationic antimicrobial peptides that compose a major first line of host defenses. G. bethesdensis may also come into contact with innate immune phagocytes. One of the first cellular responders recruited to the site of bacterial infection is the neutrophil. In vitro studies show that healthy neutrophils internalize G. bethesdensis in a complement-dependent manner and kill ∼50% of input bacteria after 24 h of infection at an MOI of 1 (13). CGD neutrophils internalize G. bethesdensis normally, but fail to kill the organism and instead control its growth, highlighting the importance of the NADPH oxidase in G. bethesdensis killing by PMN. Survival of this bacterium in neutrophils may be further enhanced by the ability of G. bethesdensis to inhibit neutrophil apoptosis (13), which would normally aid in the containment and clearance of the microbe by macrophages. Although the neutrophil may play an important role in survival of G. bethesdensis, it is relatively short-lived [∼5- to 8-h t1/2 in circulation (49)] compared with other innate immune phagocytes like monocytes [∼3-d t1/2 in circulation (50)] and macrophages [∼30-d t1/2 (51)]. Monocytes are recruited to the site of infection and undergo differentiation to macrophages within the infected tissue, which also houses resident macrophages. We demonstrate in this study that monocytes from healthy and CGD donors internalize G. bethesdensis. Although normal PMN internalization of G. bethesdensis relies almost entirely on a temperature-sensitive serum component (13), normal monocyte internalization only partially depends on a heat-labile serum component. This difference in phagocytic mechanism may be explained by the differential expression of FcRs on the two cell types (52) or the wider repertoire of receptors [e.g., scavenger receptors (53)] on monocytes. Differential expression or activation of phagocytic receptors, as well as pattern recognition receptors (PRRs) (54, 55), on PMN and monocytes may also explain the difference in relative magnitude of the respiratory burst in these two cell types, and in response to E. coli versus G. bethesdensis. For instance, PRRs dectin-1 and dectin-2 on inflammatory PMN and monocytes/macrophages have been shown to differentially contribute to fungal particle association and subsequent ROS production (56). The same study also showed that serum opsonization of zymosan or Candida albicans was important for interaction with PMN, but less so for monocytes/macrophages. One downstream effect of phagocytosis and PRR activation is the production of cytokines, which contribute to the inflammation and resolution phases of infection. In this study, we show that G. bethesdensis induces cytokine release from normal and CGD monocytes and macrophages, but to a significantly lesser extent than E. coli. Suppressing cytokine responses can be a microbial evasion mechanism as in the case of L. pneumophila, which requires a type II secretion system to dampen cytokine release from and permit growth within infected monocytes (57), although such mechanisms have yet to be described for Granulibacter. Our laboratory is currently characterizing structural differences between G. bethesdensis and E. coli endotoxin that may also contribute to the observed differences in cytokine secretion. Similar to neutrophils from normal subjects, freshly isolated and IFN-γ–treated normal monocytes kill similar amounts of input bacteria after 24 h of infection at an MOI of 1. However, unlike CGD neutrophils (13), freshly isolated CGD monocytes allow a 2- to 3-fold expansion of G. bethesdensis over 24 h, demonstrating that these cells provide a favorable environment for survival of the bacterium. Although it does not induce killing, IFN-γ treatment of CGD monocytes significantly limits G. bethesdensis outgrowth, and this effect correlates with the amount of residual ROS in CGD neutrophils. In comparison with neutrophils and monocytes, MDM are less successful in exerting bactericidal activity against G. bethesdensis even with the help of IFN-γ. Our studies demonstrate that four normal IFN-γ–treated MDM are required to control the growth of a single bacterium after 24 h of infection, and only modest killing occurs by 1 wk postinfection. This inability to kill G. bethesdensis is more pronounced in CGD MDM in which IFN-γ could not significantly control intracellular replication of the organism up to 1 wk postinfection. These data suggest that the CGD macrophage is a potential niche for G. bethesdensis growth and survival in vivo. The macrophage as a niche for bacterial replication and persistence is not unprecedented. Alveolar macrophages internalize L. pneumophila via conventional complement-mediated phagocytosis (58) or coiling phagocytosis (59) into phagosomes that permit bacterial replication and evade lysosomal fusion (60). This suitable environment for L. pneumophila replication may allow the organism to survive for a long period of time. Moreover, L. pneumophila inhibits macrophage apoptosis by blocking the effects of proapoptotic Bcl2 family members (61). Latency of the organism in patients from the 1976 Philadelphia epidemic of Legionnaires’ disease has been suggested, in which specific IgM Abs persisted for 2 y after initial infection (40). Latent infection by M. tuberculosis in one-third of the human population has been reported (41). Infected macrophages play a central role in latency by forming granulomas with Ag-specific T cells that inhibit the growth of M. tuberculosis, whereas the bacterium resists macrophage bactericidal killing (62). Like L. pneumophila, M. tuberculosis also inhibits phagosomal maturation and replicates within macrophages (63). Additionally, its virulence factors are critical for the inhibition of macrophage apoptosis (64) and pyroptosis (65). Lastly, O-Ag–positive Brucella species also prevent phagosome–lysosome fusion inside macrophages (66) and inhibit macrophage apoptosis (67), which most likely prolongs the bacterium’s intracellular survival. Cases of chronic brucellosis have been described as lasting from several months to several years after acute infection (42, 68). Taken together, the macrophage centrally contributes to the persistence of bacteria that cause chronic disease in humans. G. bethesdensis causes recurrent infections in CGD patients for years and can be recovered from normal mouse spleens up to 76 d postinoculation (3, 4). Like the other persistent bacterial pathogens mentioned above, G. bethesdensis resists killing by serum and cationic antibacterial peptides, replicates within CGD macrophages, and does not compromise the viability of infected macrophages. G. bethesdensis resists some oxygen-independent microbicides, but it may not be impervious to all nonoxidative killing mechanisms. Although the NADPH oxidase is required for G. bethesdensis clearance, it is possible that the products of the NADPH oxidase interact with and activate oxygen-independent bactericidal systems. Interestingly, all of the aforementioned bacteria have slow rates of division with G. bethesdensis doubling every 5–6 h, L. pneumophila every 3 h (69), M. tuberculosis every 24 h (70), and Brucella species every 2.5–3.5 h (71), which contrasts to E. coli’s faster doubling time of 0.5–1.5 h (72). This trait could be important for the maintenance of an intact host phagocyte and bacterial replication niche, which might otherwise lyse if overwhelmed with too many intracellular bacteria. It remains to be determined whether in vitro survival of G. bethesdensis in macrophages correlates to persistence of G. bethesdensis in vivo. The intracellular nature of G. bethesdensis infection may pose a challenge for clinical treatment. G. bethesdensis is innately multidrug resistant, and therapy of infected individuals requires aggressive antimicrobial treatments and sometimes surgical intervention (4). Ensuring the efficacy of antimicrobial therapies may require that they can penetrate infected phagocytes, as has been shown for the treatment of CGD, tuberculosis, and legionellosis (73). IFN-γ is critical for activating bactericidal mechanisms in macrophages infected with L. pneumophila (74, 75) and M. tuberculosis (76) and may prove an effective therapy for in vivo treatment of infections with these organisms (77, 78). IFN-γ may also be an effective treatment for some CGD patients infected with G. bethesdensis, as was shown for CGD patients infected with S. aureus (29). To our knowledge, we show for the first time that in vitro IFN-γ–enhanced control of G. bethesdensis outgrowth in CGD monocytes correlates with higher residual superoxide levels in PMN from the same CGD patients. Because higher residual PMN superoxide correlated with increased survival in a large CGD cohort (32), this in vitro finding may be a useful test to identify patients who are likely to respond to IFN-γ therapy and those who might not. Given the high morbidity associated with IFN-γ therapy as well as the high cost, this finding has important clinical implications. It is likely that IFN-γ boosts superoxide levels in CGD phagocytes with a certain threshold of residual superoxide, leading to enhanced control of bacterial burden. However, we cannot rule out that IFN-γ stimulates ROS-independent bactericidal or bacteriostatic pathways, such as the downregulation of transferrin receptors that limits iron availability required for the growth of some organisms (24). IFN-γ also plays a role in vitamin D–dependent upregulation of antimicrobial peptides and induction of autophagy (79); however, we found no contribution of vitamin D in the control of G. bethesdensis burden in vitro (data not shown). It will be important to establish further correlations between in vitro and in vivo IFN-γ efficacy to help identify specific CGD patients who will respond to treatment. Finding novel therapies to treat chronic intracellular infections, especially in immunocompromised populations, is crucial given that many persistent bacterial pathogens are resistant to antibiotics. We acknowledge Drs. Harry L. Malech, Suk See DeRavin, and Stephen M. Holland for generously providing us with CGD patient samples, and we thank the CGD patients who have contributed to this study. We also thank Drs. Margery Smelkinson and Stephen Becker for assistance with epifluorescence and confocal microscopy, Anthony Pettinato for blindly scoring monocyte internalization images, Drs. Mark VanRaden and Chiung-Yu Huang for statistical help, Neysha Martinez for preliminary studies provoking us to pursue this study, and Dr. David Greenberg for helpful suggestions during the beginning of this study and critical review of this manuscript. This work was supported by the Intramural Research Program of the National Institute of Allergy and Infectious Diseases at the National Institutes of Health. The views expressed here are those of the authors and not necessarily those of the U.S. Government.
. 2000. Chronic granulomatous disease: report on a national registry of 368 patients. Medicine 79: 155–169.
. 2011. Chronic granulomatous disease: a review of the infectious and inflammatory complications. Clin. Mol. Allergy 9: 10.
. 2006. A novel bacterium associated with lymphadenitis in a patient with chronic granulomatous disease. PLoS Pathog. 2: e28.
. 2010. Recurrent Granulibacter bethesdensis infections and chronic granulomatous disease. Emerg. Infect. Dis. 16: 1341–1348.
. 2008. Granulibacter bethesdensis isolated in a child patient with chronic granulomatous disease. J. Infect. 57: 275–277.
. 2009. Asaia lannaensis bloodstream infection in a child with cancer and bone marrow transplantation. J. Med. Microbiol. 58: 974–976.
. 2010. Gluconobacter as well as Asaia species, newly emerging opportunistic human pathogens among acetic acid bacteria. J. Clin. Microbiol. 48: 3935–3942.
. 2008. Acetobacter indonesiensis pneumonia after lung transplant. Emerg. Infect. Dis. 14: 997–998.
. 2007. Acetobacter cibinongensis bacteremia in human. Emerg. Infect. Dis. 13: 784–785.
. 2010. Nosocomial infection with Asaia lannensis in two paediatric patients with idiopathic dilated cardiomyopathy. J. Med. Microbiol. 59: 848–852.
. 2004. Asaia bogorensis peritonitis identified by 16S ribosomal RNA sequence analysis in a patient receiving peritoneal dialysis. Am. J. Kidney Dis. 44: e15–e17.
. 2006. First report of bacteremia by Asaia bogorensis, in a patient with a history of intravenous-drug abuse. J. Clin. Microbiol. 44: 3048–3050.
. 2012. Innate immunity against Granulibacter bethesdensis, an emerging Gram-negative bacterial pathogen. Infect. Immun. 80: 975–981.
. 1989. Macrophage phagocytosis of aging neutrophils in inflammation: programmed cell death in the neutrophil leads to its recognition by macrophages. J. Clin. Invest. 83: 865–875.
. 2010. Impaired phagocytosis of apoptotic cells by macrophages in chronic granulomatous disease is reversed by IFN-γ in a nitric oxide-dependent manner. J. Immunol. 185: 4030–4041.
. 2003. Diminished production of anti-inflammatory mediators during neutrophil apoptosis and macrophage phagocytosis in chronic granulomatous disease (CGD). J. Leukoc. Biol. 73: 591–599.
. 2007. Human polymorphonuclear leukocytes inhibit Aspergillus fumigatus conidial growth by lactoferrin-mediated iron depletion. J. Immunol. 178: 6367–6373. 2004. NOX enzymes and the biology of reactive oxygen. Nat. Rev. Immunol. 4: 181–189.
. 2003. Respiratory burst activity in bronchopulmonary dysplasia and changes with dexamethasone. Pediatr. Pulmonol. 35: 392–399.
. 2011. The augmented neutrophil respiratory burst in response to Escherichia coli is reduced in liver cirrhosis during infection. Clin. Exp. Immunol. 164: 346–356.
. 2002. Xenon preserves neutrophil and monocyte function in human whole blood. Can. J. Anaesth. 49: 942–945.
. 1978. Differences in oxygen metabolism of phagocytosing monocytes and neutrophils. J. Clin. Invest. 61: 480–488.
. 1985. Relationship between extracellular stimulation of intracellular killing and oxygen-dependent microbicidal systems of monocytes. Infect. Immun. 47: 502–507.
. 1989. Interferon gamma-activated human monocytes downregulate transferrin receptors and inhibit the intracellular multiplication of Legionella pneumophila by limiting the availability of iron. J. Clin. Invest. 83: 1457–1465.
. 1994. Human monocytes cultured with and without interferon-gamma inhibit Plasmodium falciparum parasite growth in vitro via secretion of reactive nitrogen intermediates. Parasite Immunol. 16: 371–375. 1989. Gamma interferon induces monocyte killing of Listeria monocytogenes by an oxygen-dependent pathway; alpha- or beta-interferons by oxygen-independent pathways. J. Leukoc. Biol. 46: 434–440.
. 2004. IFN-gamma induces gp91phox expression in human monocytes via protein kinase C-dependent phosphorylation of PU.1. J. Immunol. 172: 4941–4947.
. 2001. Mechanisms of expression of NADPH oxidase components in human cultured monocytes: role of cytokines and transcriptional regulators involved. Eur. J. Immunol. 31: 929–938.
. 1988. Recombinant human interferon-gamma reconstitutes defective phagocyte function in patients with chronic granulomatous disease of childhood. Proc. Natl. Acad. Sci. USA 85: 4874–4878.
. 1993. Interferon-gamma and resistance to bacterial infections. APMIS 101: 1–17.
. 1987. Recombinant interferon gamma augments phagocyte superoxide production and X-chronic granulomatous disease gene expression in X-linked variant chronic granulomatous disease. J. Clin. Invest. 80: 1009–1016.
. 2010. Residual NADPH oxidase and survival in chronic granulomatous disease. N. Engl. J. Med. 363: 2600–2610.
. 2008. Monocyte-mediated defense against microbial pathogens. Annu. Rev. Immunol. 26: 421–452. Lacey, D. C., A. Achuthan, A. J. Fleetwood, H. Dinh, J. Roiniotis, G. M. Scholz, M. W. Chang, S. K. Beckman, A. D. Cook, and J. A. Hamilton. 2012. Defining GM-CSF- and macrophage-CSF-dependent macrophage responses by in vitro models. J. Immunol. 188: 5752-5765. 2001. Pathogenicity of Legionella pneumophila. Int. J. Med. Microbiol. 291: 331–343.
. 2001. Immune responses to intracellular bacteria. Curr. Opin. Immunol. 13: 417–428.
. 2002. The innate immune response against Brucella in humans. Vet. Microbiol. 90: 383–394.
. 2007. Enhanced inflammatory responses of chronic granulomatous disease leukocytes involve ROS-independent activation of NF-kappa B. Eur. J. Immunol. 37: 1087–1096.
. 2009. Impaired macrophage function following bacterial stimulation in chronic granulomatous disease. Immunology 128: 253–259.
. 1979. The Philadelphia epidemic of Legionnaire’s disease: clinical, pulmonary, and serologic findings two years later. Ann. Intern. Med. 90: 522–526.
. 2002. Latent tuberculosis: models, mechanisms, and novel prospects for eradication. Semin. Pediatr. Infect. Dis. 13: 263–272.
. 2009. Chronic brucellosis and persistence of Brucella melitensis DNA. J. Clin. Microbiol. 47: 2084–2089.
. 1985. Serum bactericidal activity against Legionella pneumophila. J. Clin. Microbiol. 22: 863–864.
. 1999. Mechanism of serum resistance among Brucella abortus isolates. Vet. Microbiol. 68: 235–244.
. 2003. lvgA, a novel Legionella pneumophila virulence factor. Infect. Immun. 71: 2394–2403.
. 2001. Identification of Legionella pneumophila rcp, a pagP-like gene that confers resistance to cationic antimicrobial peptides and promotes intracellular infection. Infect. Immun. 69: 4276–4286.
. 2009. The two-domain LysX protein of Mycobacterium tuberculosis is required for production of lysinylated phosphatidylglycerol and resistance to cationic antimicrobial peptides. PLoS Pathog. 5: e1000534.
. 1995. The outer membranes of Brucella spp. are resistant to bactericidal cationic peptides. Infect. Immun. 63: 3054–3061.
. 1976. Neutrophil kinetics in man. J. Clin. Invest. 58: 705–715. 1966. The intravascular lifespan of monocytes. Blood 28: 455–464.
. 2008. The prolonged life-span of alveolar macrophages. Am. J. Respir. Cell Mol. Biol. 38: 380–385.
. 1990. Colony-stimulating factors and interferon-gamma differentially affect cell surface molecules shared by monocytes and neutrophils. Clin. Exp. Immunol. 81: 339–345.
. 2010. Scavenger receptors and their potential as therapeutic targets in the treatment of cardiovascular disease. Int. J. Hypertens. 2010: 646929.
. 2000. Differential expression and regulation of Toll-like receptors (TLR) in human leukocytes: selective expression of TLR3 in dendritic cells. J. Immunol. 164: 5998–6004.
. 2002. Toll-like receptor (TLR)2 and TLR4 in human peripheral blood granulocytes: a critical role for monocytes in leukocyte lipopolysaccharide responses. J. Immunol. 168: 4701–4710.
. 2012. Differential dependencies of monocytes and neutrophils on dectin-1, dectin-2 and complement for the recognition of fungal particles in inflammation. PLoS One 7: e45781.
. 2011. Legionella pneumophila type II secretion dampens the cytokine response of infected macrophages and epithelia. Infect. Immun. 79: 1984–1997.
. 1987. Phagocytosis of Legionella pneumophila is mediated by human monocyte complement receptors. J. Exp. Med. 166: 1377–1389. 1984. Phagocytosis of the Legionnaires’ disease bacterium (Legionella pneumophila) occurs by a novel mechanism: engulfment within a pseudopod coil. Cell 36: 27–33.
. 2002. Legionella phagosomes intercept vesicular traffic from endoplasmic reticulum exit sites. Nat. Cell Biol. 4: 945–954.
. 2007. Legionella pneumophila inhibits macrophage apoptosis by targeting pro-death members of the Bcl2 protein family. Proc. Natl. Acad. Sci. USA 104: 5121–5126.
. 2007. Life and death in the granuloma: immunopathology of tuberculosis. Immunol. Cell Biol. 85: 103–111.
. 2012. The Mycobacterium tuberculosis SecA2 system subverts phagosome maturation to promote growth in macrophages. Infect. Immun. 80: 996–1006.
. 2007. Mycobacterium tuberculosis nuoG is a virulence gene that inhibits apoptosis of infected host cells. PLoS Pathog. 3: e110.
. 2011. Inhibition of the plasma-membrane-associated serine protease cathepsin G by Mycobacterium tuberculosis Rv3364c suppresses caspase-1 and pyroptosis in macrophages. Front. Microbiol. 2: 281.
. 2003. Role of the Brucella suis lipopolysaccharide O antigen in phagosomal genesis and in inhibition of phagosome-lysosome fusion in murine macrophages. Infect. Immun. 71: 1481–1490.
. 2003. Interactions between Brucella melitensis and human phagocytes: bacterial surface O-polysaccharide inhibits phagocytosis, bacterial killing, and subsequent host cell apoptosis. Infect. Immun. 71: 2110–2119. 1957. Chronic brucellosis in general practice. BMJ 2: 1082–1087.
. 1998. Legionella pneumophila catalase-peroxidases: cloning of the katB gene and studies of KatB function. J. Bacteriol. 180: 5369–5374.
. 2007. Challenges in tuberculosis drug research and development. Nat. Med. 13: 290–294.
. 1975. Characterization of the electron transport system in Brucella abortus. J. Bacteriol. 122: 139–144.
. 1979. Generation time statistics of Escherichia coli B measured by synchronous culture techniques. J. Gen. Microbiol. 115: 69–77.
. 1989. The importance of penetration of antimicrobial agents into cells. Infect. Dis. Clin. North Am. 3: 461–467.
. 1994. Inhibition of Legionella pneumophila growth by gamma interferon in permissive A/J mouse macrophages: role of reactive oxygen species, nitric oxide, tryptophan, and iron(III). Infect. Immun. 62: 3197–3205.
. 1988. IFN-gamma-activated human alveolar macrophages inhibit the intracellular multiplication of Legionella pneumophila. J. Immunol. 140: 3978–3981.
. 2011. Interferon gamma activated macrophages kill mycobacteria by nitric oxide induced apoptosis. PLoS One 6: e19105.
. 2001. Transient transgenic expression of gamma interferon promotes Legionella pneumophila clearance in immunocompetent hosts. Infect. Immun. 69: 6382–6390. 2007. IFN-gamma therapy of tuberculosis and related infections. J. Interferon Cytokine Res. 27: 353–364. Fabri, M., S. Stenger, D. M. Shin, J. M. Yuk, P. T. Liu, S. Realegeno, H. M. Lee, S. R. Krutzik, M. Schenk, P. A. Sieling, et al. 2011. Vitamin D is required for IFN-gamma-mediated antimicrobial activity of human macrophages. Sci. Transl. Med. 3: 104ra102.